It would be nice if losing weight were as simple as taking a pill, but vitamin E is not that pill for weight loss. Vitamin E performs many essential functions in the human body and most people already take in more than enough for overall health. There is no proven link between higher intakes of vitamin E and weight loss, and most people don't require supplementation. Although the body can benefit from vitamin E in many ways, it does not promote weight loss. The myths about vitamin E weight loss may stem from its role as a supplement often recommended for diabetics and its heart-healthy antioxidant activity. Due to the research on diabetes, vitamin E supplementation may be a recommendation for people with diabetes, if their doctor agrees. In the body, vitamin E acts as a powerful antioxidant and eliminates free radicals. This activity benefits the entire cardiovascular system. 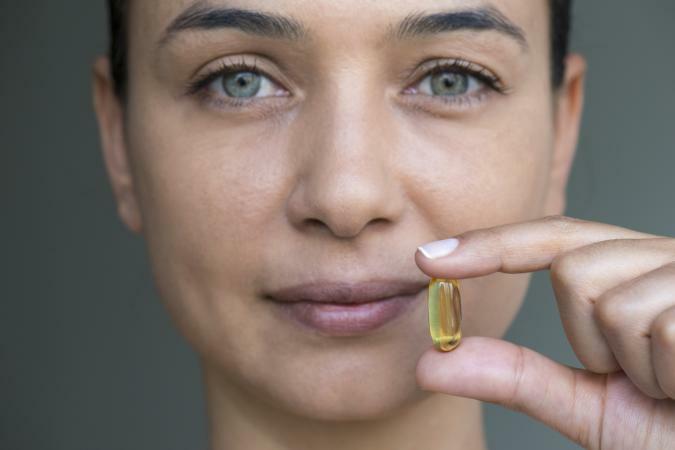 Several studies on the Linus Pauling Institute's website examined the roles of vitamin E in preventing or reducing the effects of cardiovascular disease. Vitamin E helps the body prevent oxidative stress from free radicals and acts upon LDL, the harmful cholesterol in the body. However, the Havard School of Public Health reports vitamin E may only be beneficial in certain populations when regarding heart health. No correlation exists between taking vitamin E supplements and weight loss. The vitamin does not appear to speed up metabolism or boost fat burning in any way. You'd be better off engaging in brisk aerobic activity regularly or weight training exercises to build lean muscle mass if you're looking to raise your metabolic rate. Can Vitamins Help Weight Loss? Weight loss is a complex function scientists are only beginning to understand. They know, for example, that people have a basal metabolic rate, or a basic rate at which calories are burned. To lose weight, you must consistently eat fewer calories than you burn. Currently, there is no food or vitamin will automatically make you lose weight. Foods low in calories and high in water and fiber make excellent weight loss choices, however no one food is the magical answer to weight loss. The same goes for vitamins; you cannot put synthetic vitamins in a pill, swallow the pill, and melt fat. If you do lose weight after taking vitamin supplements, the chances are you are paying new attention to health and may subconsciously be making better choices. There is no scientific evidence linking vitamin supplements such as vitamin E, weight loss, and fat burning. The following websites provide the latest information about vitamin E studies. Most studies are looking at vitamin E's potential to treat or prevent cancer, improve heart disease and blood cholesterol, or its use in diabetics. Mayo Clinic provides an overview of vitamin E.
National Institutes of Health Office of Dietary Supplements provides an extensive debriefing on vitamin E and its role in health. Medline Plus cites new research linking excessive vitamin E intake with adverse reactions. Supplements contribute to other vitamins you are already getting from a multivitamin supplement, fortified foods, and natural foods. It has been established that vitamin E has no effect on weight loss. Although it is a beneficial nutrient, it may not be necessary to supplement it. See a dietician or talk to your physician for the proper dose if you wish to take vitamin E supplements. If you have any questions about supplements and health, talk to your doctor or a medically qualified person.